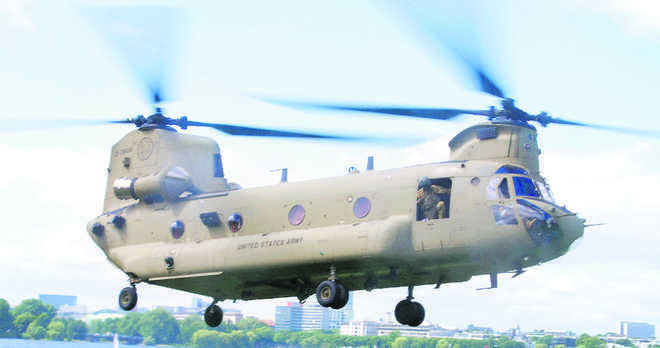 The first lot of four CH-47F Chinook helicopters arrived in India on Sunday at a port in Gujarat. In what will augment the capabilities of the Indian Air Force and enable rapid deployment of troops, the first lot of four CH-47F Chinook helicopters arrived in India on Sunday at a port in Gujarat. These helicopters will be based at Chandigarh, the existing home of the 126 Helicopter Unit, which holds the Soviet-origin heavy lift copters Mi-26. “The Chinooks will be ferried to Chandigarh where a formal induction is scheduled later this year,” manufacturer Boeing said in statement. India and the US had signed a deal for 15 Chinook copters in September 2015. The first four are part of that delivery and the next lots will arrive in batches. The four Chinooks arrived at Gujarat on board a ship. The Chinook is a multi-mission helicopter that features a fully integrated, digital cockpit management system and a common aviation architecture cockpit. The massive helicopter can carry 9.6 tonne of cargo, including heavy machinery, artillery guns and even light-armoured vehicles to high-altitude areas. It is also used for transport of troops, equipment and fuel. It is also used for humanitarian and disaster-relief operations, in missions such as transportation of relief supplies and mass evacuation of refugees. The last time a set of Chinooks flew over Chandigarh was in 2015 when the UK’s Royal Air Force sent a few of the Chinooks for assistance during the Nepal earthquake. The copters were then assembled at the Chandigarh base. The city being a supply base for Ladakh, Kargil and Siachen, it also has a base repair depot.